ANKARA: Turkey has killed at least 260 Syrian Kurdish fighters and Islamic State militants in its four-day-old offensive into the Kurdish-dominated Afrin region of northwest Syria, the Turkish military said on Tuesday. US President Donald Trump plans to raise concerns with Turkish President Tayyip Erdogan in a phone call expected on Wednesday about Ankara’s offensive against US-backed Kurdish YPG forces in Afrin, a senior US official said. French President Emmanuel Macron also voiced disquiet, a few hours after Turkey’s foreign minister said it wanted to avoid any clash with US, Russian or Syrian government forces during its offensive but would do whatever necessary for its security. The air and ground operation has opened a new front in Syria’s multi-sided civil war and could threaten US plans to stabilise and rebuild a large area of northeast Syria – beyond President Bashar al-Assad’s control – where Washington helped a force dominated by the YPG to drive out Islamic State militants. The United States and Russia both have military forces in Syria backing opposing sides and have called for restraint on the part of Ankara’s “Operation Olive Branch” to crush the YPG in the Afrin region near Turkey’s southern border. A senior Trump administration official, who briefed reporters on condition of anonymity, said Ankara had sent “conflicting signals” about the scope of the offensive. “We would urge them to limit the incursion as much as possible,” the official said, who said the phone call would happen soon. Another official – as well as Turkey’s foreign minister – said Erdogan and Trump planned to speak on Wednesday. Erdogan told Macron on Tuesday Turkey was taking all measures to prevent civilian casualties in the Afrin operation, sources at the presidential palace said. The two leaders agreed to stay in close contact on the issue. The Kremlin said President Vladimir Putin had also discussed Turkey’s military operation Erdogan by phone and that Syria’s territorial integrity and sovereignty had to be respected. A Kremlin statement said both men stressed the importance of continuing their two countries’ joint work to try to find a peaceful resolution to Syria’s crisis. Russia has been Assad’s most powerful ally against rebels and militants in Syria. Turkish Foreign Minister Mevlut Cavusoglu reiterated Ankara’s demand that Washington stops supporting the YPG. The United States hopes to use the YPG’s control in northern Syria to give it the diplomatic muscle it needs to revive UN-led talks in Geneva on a deal that would end Syria’s civil war. Ankara has been infuriated by the US support for the YPG, which is one of several issues that have brought ties between Washington and its Muslim NATO ally close to breaking point. 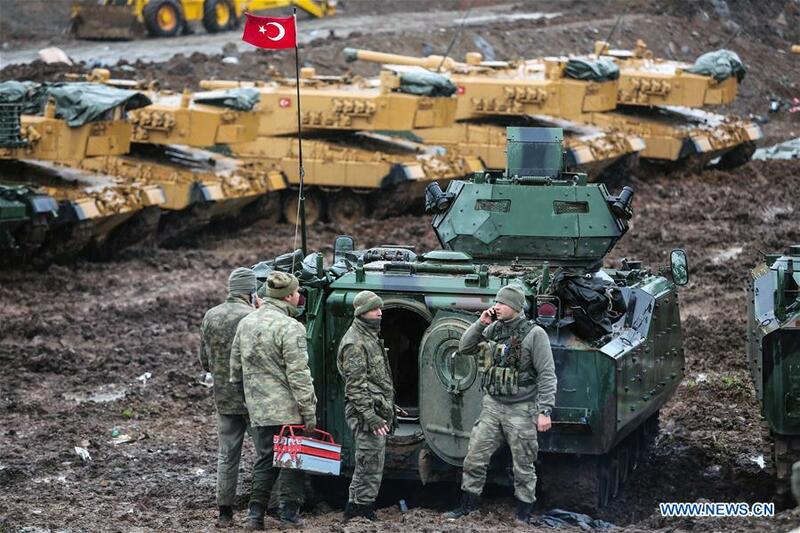 Turkey’s military, the second largest in NATO, has conducted air strikes and artillery barrages against targets in Afrin, and its soldiers and allied Syrian rebels tried to thrust into the Kurdish-held district from west, north and eastern flanks. With heavy cloud cover hindering air support in the last 24 hours, advances have been limited and Kurdish militia has retaken some territory. Turkish troops and the Syrian fighters have been trying to take the summit of Bursaya Hill, overlooking the eastern approach to Afrin town. The Syrian Observatory for Human Rights, a Britain-based war monitor, said 23 civilians had been killed in Turkish shelling and air strikes and thousands were fleeing the fighting. US Defence Secretary Jim Mattis said Turkey’s offensive distracted from efforts to defeat Islamic State. White House spokeswoman Sarah Sanders said the United States wanted to see Turkey “de-escalate,” which Trump would raise in the call with Erdogan. Ankara says the jihadist group is largely finished in Syria and that the greater threat comes from the YPG, which it sees as an extension of a Kurdish group that has waged a decades-long separatist insurgency inside Turkey. Erdogan has said Turkey aims to destroy YPG control not just in the Afrin enclave but also in the mainly Arab town of Manbij to the east. “Terrorists in Manbij are constantly firing provocation shots. If the United States doesn’t stop this, we will stop it,” Cavusoglu was reported as saying on Tuesday. “Our goal is not to clash with Russians, the Syrian regime or the United States, it is to battle the terrorist organisation,” broadcaster Haberturk quoted him as saying. “We will not live with fear and threats,” Cavusoglu said. Later on Tuesday Cavusoglu discussed the crisis with US Secretary of State Rex Tillerson during a conference in Paris. A UN report, citing local sources, said about 5,000 people in the Afrin district had been displaced as of Monday but that some of the most vulnerable had been unable to flee. It said the United Nations was ready to provide aid to 50,000 in Afrin.